Outline of the Ten Commandments Tablet -Beth Israel uses this symbol on the doors of the Holy Ark in the Sanctuary, and the opening words of the Ten Commandments are on the back wall of the Sanctuary. 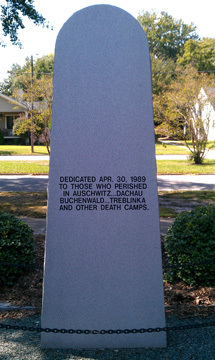 It is used here to tie the Memorial to the life of our congregation. Yellow Star of David -This universal symbol of Judaism was perverted by the Nazis. Jews were instructed to wear a yellow star on the outside of their clothing so that they could be instantly recognized, and shamed. Many Jews, however, and others of different communities, wore the star as a badge of pride, asserting that despite it all, they proudly clung to Israel’s covenant with God. In that sense it is raised to the apex of the Memorial. Posts and Chain -These were added to the Memorial to represent the guard towers and the fences surrounding the extermination camps. Gray Gravel -Spread at the base of the Memorial, the gravel, and the particular color chosen, are a sad reminder of the ashes of those Holocaust victims who were killed and cremated, their ashes left to blow to the corners of the earth. Landscaping -The particular shrubs were chosen because they are ever-green and because these varieties will have some blooms almost all year. The Nazi horror murdered 1/3 of our people, but AM YISRAEL CHAI, the people, Israel, lives on! The Memorial Stone -Thrusting upward, the stone stands proudly to indicate that Jews and Judaism have survived; will continue to do so; still reach for God, for human perfection and for God’s Kingdom here on earth. 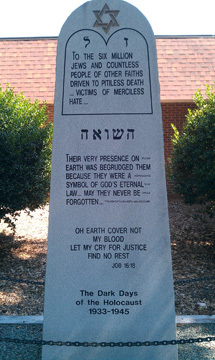 In our quest for God, we affirm that the victims of the Holocaust shall never be forgotten. In our quest for God, we affirm that it is our personal responsibility to cry out for all who suffer at human hands.